I was in high school when I saw the movie, Davy Crockett, King of the Wild Frontier, and was fascinated by his life story that I went to our school library to read more about him. 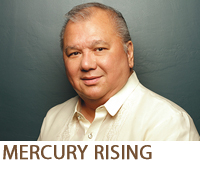 He was an American folk hero from Tennessee and was elected to a seat in the US Congress. However, due to his continuous opposition to the policies of then-President Andrew Jackson, he lost in his bid for re-election. Disappointed over his narrow loss to his opponent, he moved to Texas, which was at that time a Mexican state named Tejas. 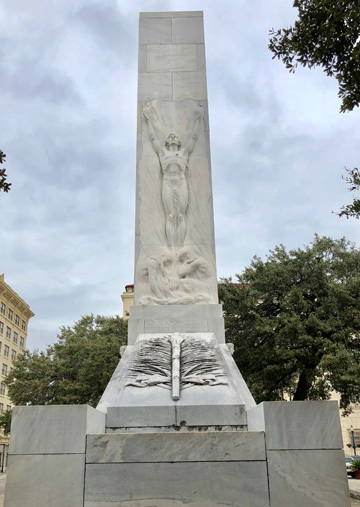 Deeply committed to his convictions, Crockett joined the war against Mexico and was killed in the Battle of the Alamo, a historical event which, again, piqued my curiosity as it was a highlight of the Texas Revolution. I wanted to know how the battle cry, “Remember The Alamo” came about. At the churchyard, the museum staff are dressed in period costumes and share their knowledge and enthusiasm with tourists. This lady showed us what items were used by housewives at that time. Originally a Catholic Mission named San Antonio de Valero, and built to convert to Christianity the Native Americans settled in the area, the church was more popularly known as The Alamo (Spanish for “cottonwood tree”) because there were many of these trees around it. Several months before the siege of The Alamo, the Texans had driven out the Mexicans, but only about a hundred Texans, led by Davy Crockett, were left to defend The Alamo. Some reinforcements, led by James Bowie and William Travis joined them later, as they clashed against around 1,500 Mexicans who were on their first move to re-take Texas. The Alamo defenders, led by these three gallant soldiers, although greatly outnumbered, held on to their brave defense and staved off the Mexican attack for almost two weeks, repelling the first two waves of assault. Meantime, the Texan defenders kept pleading for reinforcement and additional supplies, but very little help came. On the Mexicans’ third wave of assault, The Alamo fell. Crockett, Bowie, and Travis were killed and some of those who surrendered were quickly executed by the Mexicans. 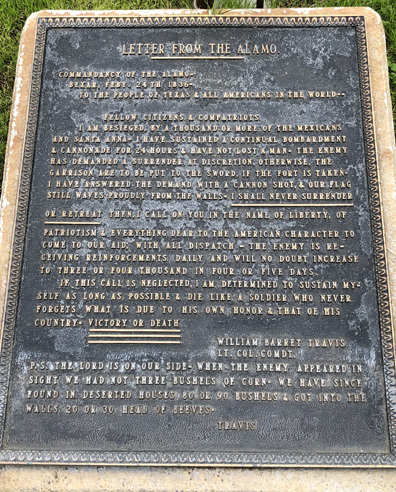 This bronze tablet, in front of The Alamo’s facade, is a copy of the letter of Lt. Col. Travis pleading for reinforcement and supplies, of which very little came. The brave front put up by the defenders of The Alamo sparked a deep commitment from the other soldiers in the Texan army to avenge the defeat of their compatriots. So several weeks later, when Sam Houston and his soldiers staged a surprise attack on the Mexicans in the Battle of San Jacinto, many of the Texan soldiers repeatedly cried, “Remember The Alamo,” giving them the courage and strength to defeat their enemy in less than 20 minutes! These days, when people say “Remember The Alamo,” they actually want to point out the bravery and desire to win in the face of overwhelming odds, as exhibited by those fearless Texan soldiers. The Alamo is such an inspiring saga in American history that I made sure I would visit it during my recent trip to Texas. After an almost three-hour drive from Houston, we parked our van at the Hyatt Regency San Antonio which is right across The Alamo. It was such a thrill to see this historical icon right in front of me, as it “teleported” me back to my high school days when I first learned of it. Once you get inside the perimeter of the church and its walls, you can easily imagine how it must have felt during the Mexican siege. The serene church interiors, although a reconstruction from the original structure’s ruins, still gives you that sense of strength and fearless perseverance which, I’m sure, was the reason why the outnumbered Texan defenders lasted almost two weeks in fighting off the invaders. My brother-in-law Gus de Medeiros and I, after having learned from the tour guide that the name “alamo” is Spanish for the cottonwood tree, painstakingly searched the premises so we could see what the tree looks like. Unfortunately, we could not find any, much to our disappointment, as the trees we saw in the churchyard were either pecan or oak. It would have added value to this tourist destination if some of those alamo trees were still onsite. The Alamo Cenotaph, also known as The Spirit of Sacrifice, commemorates the epic battle and contains the names of those who fought there. 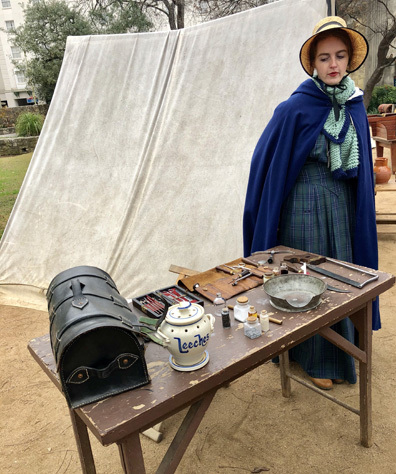 Originally built in 1718, The Alamo has evolved from a Mission to fortress, to battlefield, to warehouse, to shrine, and now, to a museum, as the State Legislature transferred custodianship of The Alamo Complex to the Texas General Land Office. No matter what identity it assumes, to me, when I think of gallantry in the face of overwhelming odds, I will always Remember The Alamo! BOYFRIEND: I might not be rich. I have no money or villa or cars or companies like my friend, John, but I love you and adore you. GIRLFRIEND: (Looks at him with tears in her eyes and hugs him like there is no tomorrow, and lovingly whispers in his ear) If you really love me that much, introduce me to John.